The kids and I just watched The Waterboy. It's as bad as I remember it, but they thoroughly enjoyed it. The Waterboy came out in 1998 and was the first in a long string of unfunny Adam Sandler movies. Some will argue that Adam Sandler movies have never been funny, but I distinctly remember laughing out loud several times during Billy Madison. Happy GIlmore wasn't too shabby, either. So what happened to Adam Sandler? I wouldn't dare watch his recent movies like That's My Boy, Jack and Jill or I Now Pronounce You Chuck & Larry. I accidentally stumbled across You Don't Mess with the Zohan and I'm still trying to delete the memories from my psyche. That was one unfunny comedy. 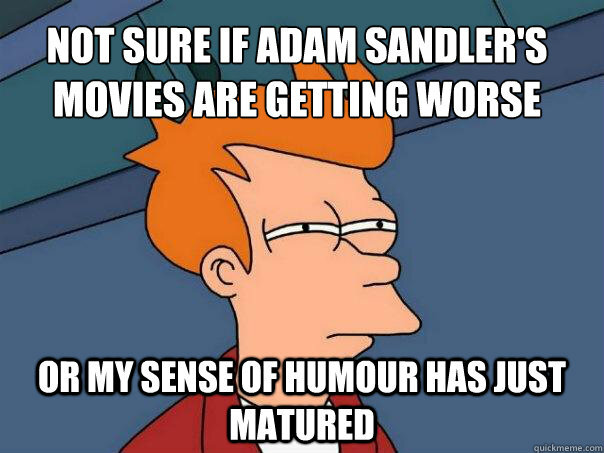 I want to know which Adam Sandler movies you've enjoyed. I've enjoyed Billy Madison, Happy Gilmore, The Wedding Singer, Punch-Drunk Love and didn't hate Mr. Deed. Here's a matrix to help you. I thought You Don't Mess With the Zohan was pretty funny. His last movie That's my boy is great. Airheads, Billy Madison, Happy Gilmore, You Don't Mess With The Zohan, Little Nicky,The Wedding Singer, I Now Pronounce You Chuck & Larry & Click. Grown Ups was ok.
Not that Rotten Tomatoes is the best gauge as to whether a film is good or not, it's not a bad way to measure whether one should waste 90 minutes on a movie or not. 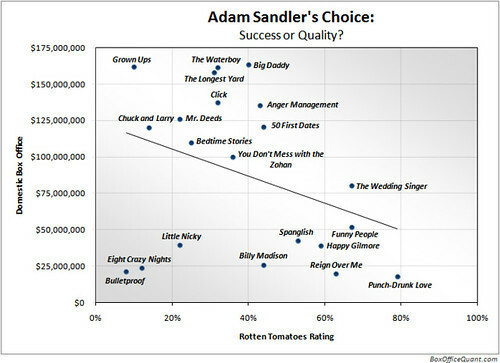 Further research conforms that Adam Sandler movies can be good, or successful, but never both. I should give a flying frack about what a bunch of snobs care about a man who's work is no worse (and just as good) as that of Jerry Lewis's pictures? In twenty years, they'll be calling his stuff classic just like they do Lewis's movies (and previous to that, Martin & Lewis, Abbot & Costello, The Bowery Boys, The Three Stooges, The Marx Brothers, and everything else seen on TCM and Silver Screen Classics.) Screw the haters. Do animated movies count? We watched Hotel Transylvania on the weekend and enjoyed it. I also liked Happy Gilmore, The Wedding Singer, 50 First Dates,Spanglish, Reign over Me and Funny People. I've watched Billy Madison, Happy Gilmore, Little Nikki and Waterboy with the kids. The RT score doesn't scare me away when it comes to Adam Sandler, although I will resist the urge to see just how bad Jack and Jill actually is. 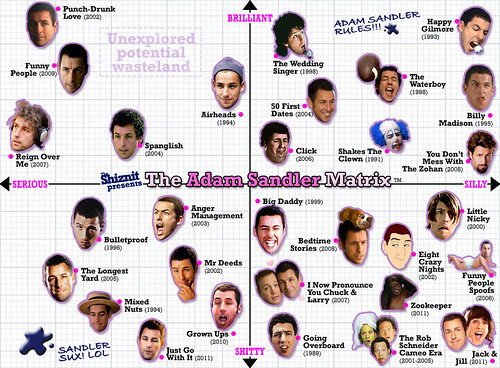 Sandler is hit and miss for me although lately more of a miss. However, one of my favourites (along with the usual tha thave already been mentioned) is Funny People. I loved that movie.